As an estate planning attorney, you focus your practice on two things: building lifetime relationships with your clients and crafting estate plans tailored to each client’s specific needs. Many attorneys across the country are considering Financial Services a natural extension of an estate planning practice. If your goal is to have a long-term relationship with your clients and to help protect them from the problems of life, helping your clients with financial planning is the next step toward accomplishing your goal. For a client to have a financial plan that dovetails with his or her estate plan – what could provide more confidence? The systems in your law firm should be solid before you launch a second business. The timing of such a venture is key, as is appropriate preparation for and structuring of your new enterprise. Ask us about Members who have successfully set financial services in motion in their area. There are rules in each state that you must be aware of as well as best practices for setting up a second business. Done right, this type of business takes client service to a whole new level! “Here is some food for thought. It is best to go through a series of questions you ask yourself. The first one has to do with your personal philosophy as an attorney. Will you only practice law or will you expand and meet additional needs of clients? Many are comfortable providing more than legal services. Most states allow this as long as the ethical rules and guidelines are followed. The next question is the Broker Dealer model vs. the RIA model with an ability to provide insurance when needed. We have crossed that line leaving the Broker Dealer model behind and think the Matson Money Coaching model aligns perfectly with the Academy model. The next question is simple to ask but complex to answer. When is the right time to move onto financial services/coaching? The items you need to examine are your own time availability, your resources, which include both personnel and money, as well as the state of your law practice. Is your law firm on a solid foundation? A solid foundation has many components and the basics include systems which are implemented for lead generation, lead conversion, fulfillment of the work, and management of the business as well as finances. An important aspect is comparing your firm financials to Academy benchmarks, especially owner’s compensation. As you spend timing analyzing the current condition of the law firm, take care to be realistic about resources needed to start another business. Hopefully this will be helpful as you apply your specifics to these general guidelines. 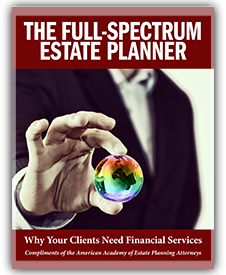 TO GET A COPY OF THE ACADEMY’S REPORT on introducing financial services to your firm, “The Full Spectrum Estate Planner,” simply CLICK HERE to fill out our information form and we’ll send it to you immediately!